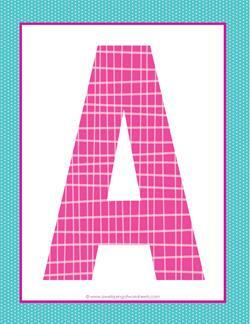 Take a look at these big alphabet letters! 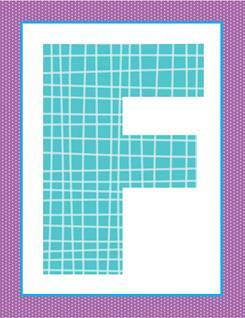 Imagine them posted up on the walls in your classroom, so colorful, brightening up the whole place. 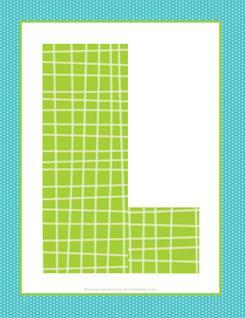 Or just use them for your letter of the week lessons. 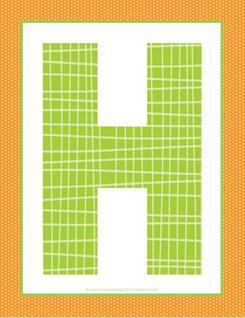 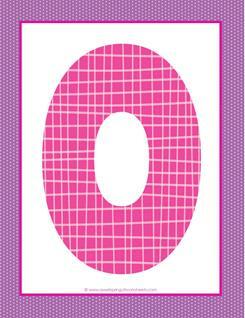 With a traditional block print these would be perfect for dressing up your lessons for each alphabet letter. 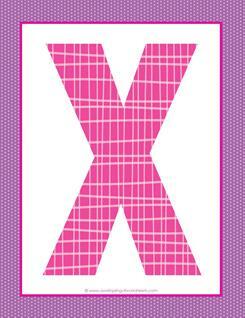 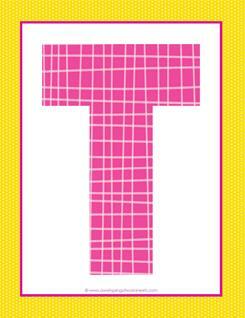 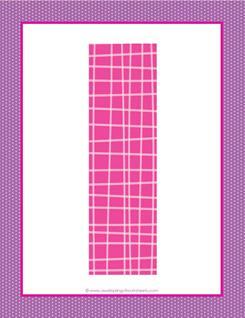 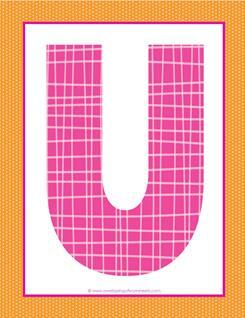 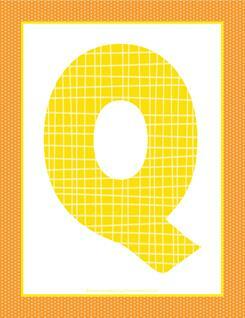 27 pages of 8 1/2 x 11″ letters in plaid and polka dot. 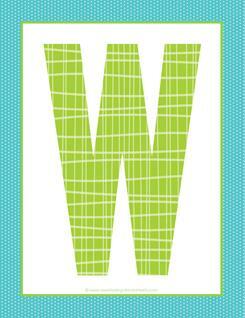 These do not come in lowercase. 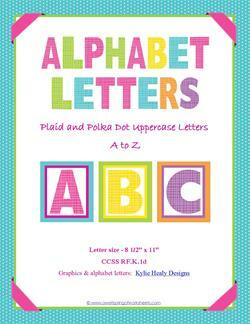 Go to this page to see smaller coordinating alphabet letters in plaid and polka dot or this page to see more alphabet letter sets. 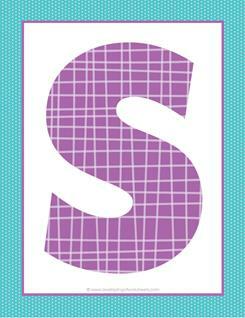 This colorful upper case alphabet letter A has a small blue polka dot background with a pink frame around a large pink plaid alphabet letter A. 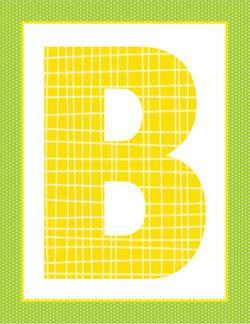 This colorful upper case alphabet letter B has a small green polka dot background with a yellow frame and big bold yellow plaid alphabet letter B. 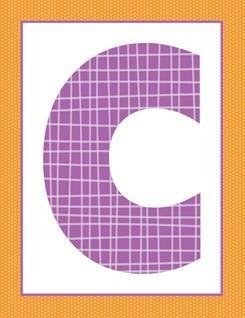 This colorful upper case alphabet letter C has small orange polka dot background with a purple frame and big purple plaid alphabet letter C.
This colorful upper case alphabet letter D has a small yellow polka dot background with an orange frame and big orange plaid alphabet letter D.
This colorful upper case alphabet letter E has a small pink polka dot background with a bright blue frame and large bright blue plaid alphabet letter E.
This colorful upper case alphabet letter F has a small purple polka dot background with a bright blue frame and big bright blue plaid alphabet letter F.
This colorful upper case alphabet letter G has a small green polka dot background with a bright blue frame and big bright blue plaid alphabet letter G.
This colorful upper case alphabet letter H has a small orange polka dot background with a green frame and big green plaid alphabet letter H.
This colorful upper case alphabet letter I has a small purple polka dot background with a bold pink frame and big bright pink plaid alphabet letter I. 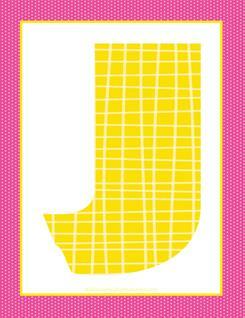 This colorful upper case alphabet letter J has a small pink polka dot background with a bright yellow frame and big bold yellow plaid alphabet letter J. 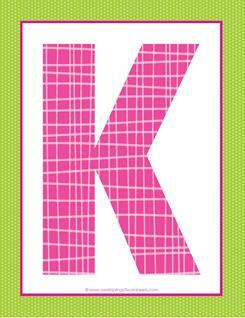 This colorful upper case alphabet letter K has a small green polka dot background with a bold pink frame and big bright pink plaid alphabet letter K.
This colorful upper case alphabet letter L has a small blue polka dot background with a green frame and big green plaid alphabet letter L.
This colorful upper case alphabet letter M has a small orange polka dot background with a bright blue frame and big blue plaid alphabet letter M.
This colorful upper case alphabet letter N has a small yellow polka dot background with a bright blue frame and big blue plaid alphabet letter N.
This colorful upper case alphabet letter O has a small purple polka dot background with a pretty pink frame and big pink plaid alphabet letter O. 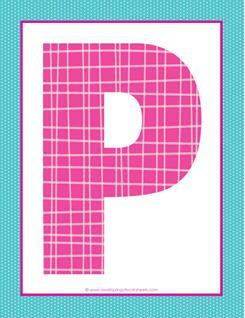 This colorful upper case alphabet letter P has a small blue polka dot background with a pretty pink frame and big pink plaid alphabet letter P.
This colorful upper case alphabet letter Q has a small orange polka dot background with a yellow frame and big yellow plaid alphabet letter Q. 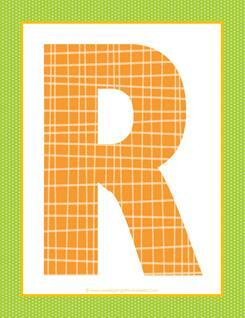 This colorful upper case alphabet letter R has a small green polka dot background with an orange frame and big orange plaid alphabet letter R.
This colorful upper case alphabet letter S has a small blue polka dot background with a purple frame and big bright purple plaid alphabet letter S.
This colorful upper case alphabet letter T has a small yellow polka dot background with a bright pink frame and big pink plaid alphabet letter T.
This colorful upper case alphabet letter U has a very small orange polka dot background with a bright pink frame and large pink plaid alphabet letter U. 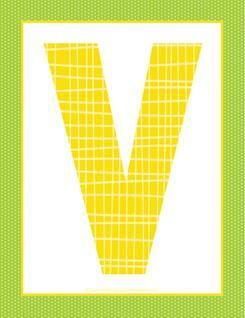 This colorful upper case alphabet letter V has a small green polka dot background with a bright yellow frame and big yellow plaid alphabet letter V.
This colorful uppercase alphabet letter W has a small blue polka dot background with a solid green frame and big green plaid alphabet letter W.
This colorful upper case alphabet letter X has a small purple polka dot background with a solid pink frame and big bright pink plaid alphabet letter X. 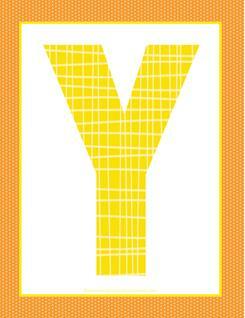 This colorful upper case alphabet letter Y has a small orange polka dot background with a yellow frame and big yellow plaid alphabet letter Y. 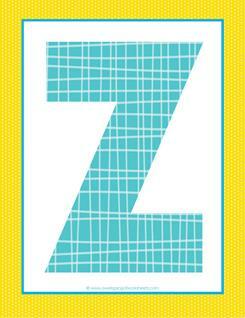 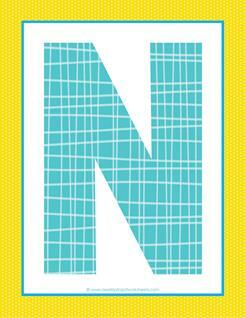 This colorful upper case alphabet letter Z has a small yellow polka dot background with a bright blue frame and big blue plaid alphabet letter Z. 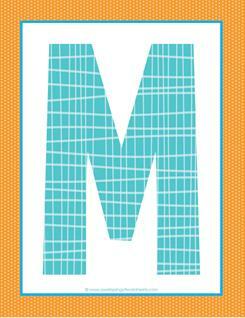 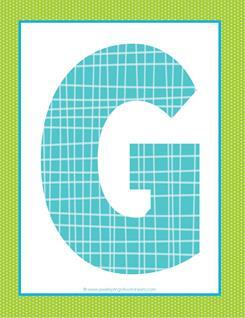 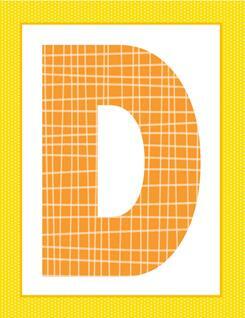 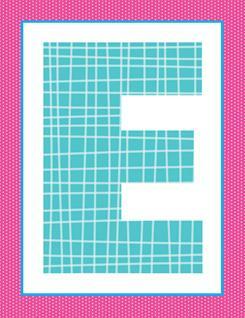 Check out the whole set of these big alphabet letters in plaid and polka dot in one easy to print PDF.